This page was originally a handout for a couple of our microbiology lab courses. Adapted from our glucose catabolism page at http://www.jlindquist.com/generalmicro/dfglucosenf.html. Testing whether an organism can ferment glucose is one of the basic, primary tests in the identification of chemoheterotrophic bacteria. For this test we routinely use a "Glucose Fermentation Broth." Fermentation of glucose results in the abundant production of acidic end products, the presence of which can be detected by the pH indicator in the medium. Many organisms produce gas – either CO2 alone or a mixture of H2 and CO2. H2 is insoluble and is detected by bubble formation in a Durham tube placed in the medium. Note the examples shown below. Tube 1: No fermentation. The pH indicator remains purple. There can still be growth due to the use of amino acids as sources of energy (usually by respiration). 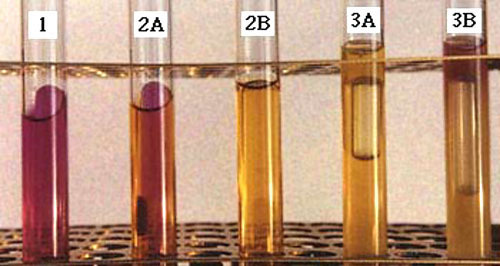 Tubes 2A and 2B: Fermentation with the production of acid (yellow color) but no gas. A slight amount of acid is seen in tube 2A, but fermentation is still recorded for this tube. Tubes 3A and 3B: Fermentation with the production of acid (yellow color) and insoluble gas (bubble in Durham tube). Tube 3B shows an alkaline reaction on top; this is simply due to deamination of amino acids whose alkaline reaction has not been over-neutralized by the acid diffusing through the tube from fermentation. Page was last modified on 6/20/05 at 1:15 PM, CDT.